Template: Project template for the new project. lua: Minimum Lua based project. Main Directory: Main directory for the project. Sub Directory: Sub directory for the project. 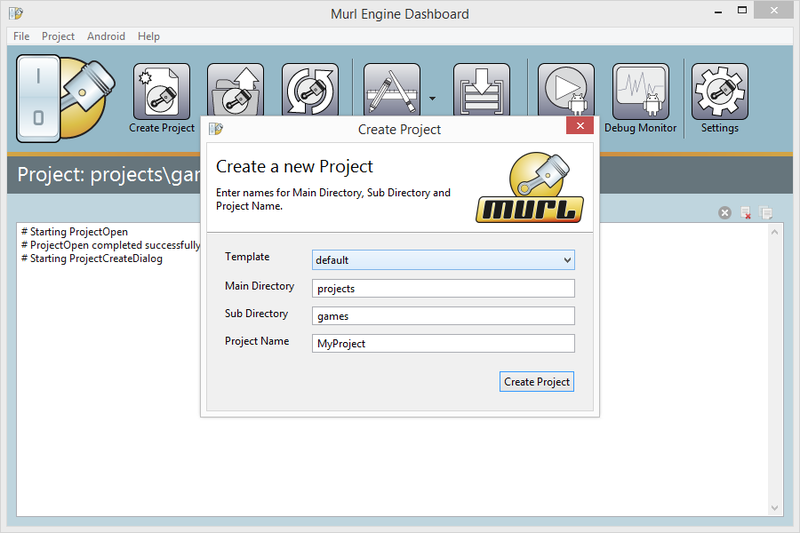 Both directory names (Main Directory and Sub Directory) need to be assigned a value because the project files use relative file paths to the tools and libraries of the Murl Engine. Therefore it is important that the project directory is placed two levels above the murl directory. This default directory structure has proved to be very useful in many projects. You are therefore advised to keep the structure. The source directory contains the source files of the project (C++ files and header files). The data directory is used to store all data files and assets for the project e.g. images, sounds, animations etc. The packages sub directory contains the resource directories and resource packages. Usually other sub directories are used as well like e.g. original for storing files in their original file format. The project directory contains the individual project files for the different platforms and IDEs. One Xcode project is provided for iOS and one for OS X. For Windows individual projects for Visual Studio 2008, 2010 and 2013 are available. Individual command line scripts (bash scripts and batch files) for the Gnu Make build tool are provided for Android and Linux. The scripts utilize the common Makefiles in the common directory. So those Makefiles are shared between the Android build and the Linux build. The resources directory contains additional platform dependent resources like icons, launch images etc. The scripts directory contains command line scripts for the project. The documents directory can be used for concept descriptions, ToDo lists, feature lists, app descriptions etc. After a project has been built successfully, the created application file can be found in the binaries directory.